Why Is McKinney Investing in Morocco Hospitality? Why is McKinney Investing in Morocco? McKinney invests in commercial real estate in a wide range of geographic locations and asset classes, enabling investors to build a commercial real estate portfolio tailored to their risk tolerance. We always have a purpose behind choosing the places we invest. Here’s our “why” behind our investing in Morocco. Our Director, International Business Development, Nour-Dean Anakar, was born and raised in Tangier, Morocco. His father, Mohktar, as well as two of his uncles, were very well-known throughout the Moroccan hospitality industry. When Nour-Dean was in elementary school at the American School in Tangier, his father was operating El Minzah, the leading iconic hotel in Morocco. It was the favorite choice in Morocco for many famous authors, celebrities, royals, and heads of states. Frequent guests included Ernest Hemingway, Paul Bowles, Clark Gable, Humphrey Bogart, Catherine Hepburn, Peter O’Toole, Queen Elizabeth, Princess Grace of Monaco, King Juan Carlos of Spain, and the Shah of Iran. After El Minzah, Nour-Dean’s father was also part of the management team that opened other leading iconic hotels in the region including La Mamounia in Marrakesh, ranked one of the top 10 luxury hotels in the world in the 70s & 80s, the Caleta Palace Hotel in Gibraltar, and the Solazur Beach Resort in Tangier. Throughout high school and college summer breaks, Nour-Dean and his three brothers served hospitality internships with their father in Morocco and Europe. After college, Nour-Dean joined Ladbrokes, the leading European hospitality company, and went on to become the group’s Managing Director in South America where he developed and opened many of their leading hotels and resorts. Nour-Dean’s three brothers also followed the family legacy and chose hospitality management careers throughout Europe and the United States. Nour-Dean’s father was renowned in Tangier not only for his hospitality expertise but for training and mentoring many young Moroccans who went on to become the top hotel and restaurant managers in the region, including our very own Moroccan hotel executives for the investment, Jamil Marchal, and Abdelilah Elalaoui. It’s important to McKinney to always positively impact the local areas where we invest. One of the first ways was hosting 20 Moroccan children from an orphanage in Tangier for a day at the Hermes Ranch. We worked with the Moroccan Royal Guard and the Swiss Ambassador to make this possible. We intend to continue programs and events for the community locally in Tangier and Larache. So…why Morocco? 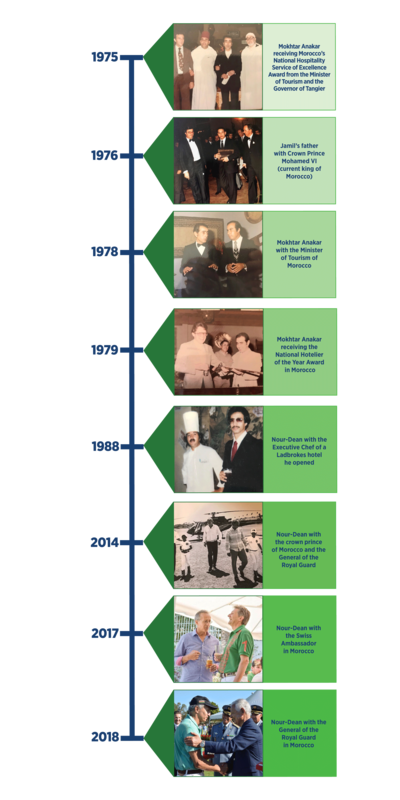 It’s the place where Nour-Dean discovered his passion for hospitality, where his father’s legacy opened doors for him to create his own reputation for excellence, and where we are positioned for success from acquisition to exit. To learn more about our investment opportunities, email Nour-Dean Anakar at nanakar@mckinneycapital.com.